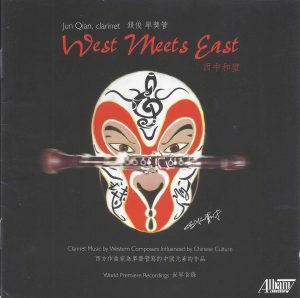 Jun Qian’s recent album West Meets East explores the nature of cross-cultural influences in music. Qian currently serves on the faculty of Baylor University in Texas and is principal clarinetist of the Waco Symphony. Among many other previous appointments, he also taught at St. Olaf College and performed as principal clarinetist of the Shanghai Philharmonic Orchestra. The title of the album stems from the two previous albums in this series, East Meets West Volumes 1 and 2. While East Meets West explores the intersection of Chinese and American culture through well-known Chinese composers working in the United States – featuring Bright Sheng, Chen Yi, and Zhou Long among others – West Meets East is Qian’s reversal of this theme, bringing together American and European colleagues to reflect and explore Chinese influences from a Western perspective. Monkey King for B-flat clarinet and fixed media (2016) by Justin Merritt, composition professor at St. Olaf College, features highly programmatic, energetic clarinet writing that shows off Qian’s technical flair. He is able to traverse wide ranges and furious 16th-note passages with ease and a warm color palette that contrasts the backing tape track. The work itself is based off of the tale of the Monkey King, as depicted in the 16th-century Chinese classical novel Journey to the West, with both movements following different narrative arcs of battles. Each has many exciting points that evoke a film score aesthetic, though I wish the tape track had made more transformative use of electronics as a medium. Matthias Mueller’s Arabesque for solo clarinet (2016) uses lilting lines and Debussy-like passages to explore the warmth of the clarinet. As professor of clarinet at the Zurich University of the Arts, Mueller writes in a way that epitomizes the clarinet’s sound and ability to sing through phrases, which Qian effectively captures in his performance. The composition sounds idiomatic and should interest professionals, pedagogues and students alike. Patrick Lenz’s take on the project’s theme, Funk Shui for B-flat clarinet and bass clarinet duet (2016), depicts what he sees as internal and external categories of Chinese martial arts against long melodic passages and funk-inspired pitch bends and harmonies. Ben Quarles anchors the work with a solid, recurring bass clarinet ostinato, which Qian weaves through melodically. Edward J.F. Taylor’s Azure Dragon of the East for B-flat clarinet and percussion (2016) explores stargazing with the Azure Dragon of the East, which is “the astral representation of the stars visible along the ecliptic during the spring months,” according to the liner notes. The work is by far the longest on the album at 24 minutes, with a sound that is similar to that of Taylor’s former teacher Charles Wuorinen. The composition makes use of the richness of tone available with the combination of marimba, woodblocks and clarinet. Percussionist Todd Meehan and Qian work well together, with the unison and imitative passages showing their rhythmic precision and ability to shape phrases together. Free Translations of Li-Ch’ing-Chao: Three Musical Settings for clarinet, soprano and piano (2016) by Paul Sánchez sets three poems by 12th-century female poet Li Ch’ing Chao, translated by Luke Taylor, capturing the spirit of three stages of life, titled “Youth,” “Middle Age” and “Old Age.” Soprano Kayleen Sánchez uses a pure tone with little vibrato that evokes the text perfectly. Repetitive piano figurations ebb and flow across each movement, expressing each stage of life eloquently. “Old Age” creates a particularly effective emotional shift with dark and openly voiced piano chords. New York Improvisatory Dialogue II for clarinet and sheng (2016) developed out of Qian’s visit to New York’s Morgan Library to research copies of the original Brahms sonata manuscripts. He and Jianbing Hu approach the improvisational dialogues with influence taken from both the Brahms clarinet sonatas and Chinese dance music, but never so overtly as to detract from the gorgeous colors achieved by blending the unique sound of the sheng with the warm chalumeau register of the clarinet. Scott Steele’s Su Counterpoint for clarinet, percussion, and zheng (2014) is the least tonal work on the album and the most timbrally varied. Steele’s work is a dichotomy of stasis and placidity against moments of dense texture and motion. Qian sounds rich in the blend with percussion and zheng, and the treatment of the material was a refreshing variation from the harmonic palette of the preceding works. Qian’s latest recording brings together many talented composers and performers in this ambitious project. It offers many interesting moments, showcases his superb ability as a musician, and disseminates many accessible new works to explore. Although I desired more timbral variety and ventures out of the overtly melodic realm, the positive attributes of this recording overshadow those thoughts. West Meets East definitely deserves to be heard. 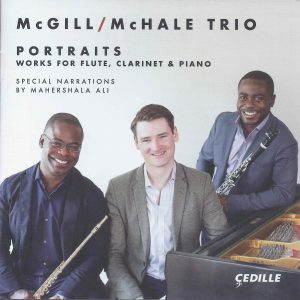 Portraits is a new compact disc by the McGill/McHale Trio. The recording is full of interesting world premieres and arrangements for the trio and was recorded at the Reva and David Logan Center for the Arts at the University of Chicago in 2017. First up on the recording is Chris Rogerson’s A Fish Will Rise. In this opening work the ensemble establishes a well-balanced sound that is present throughout the recording. Rogerson’s work is immediately recognizable and pleasing to the listener. His style is reminiscent of Copland and he is able to create the spacious and open feeling that you might experience in the great plains of the American heartland. The ensemble delivers a good performance of this work; however, it felt somewhat heavy at times and I may have preferred a slightly lighter sound. Intonation of the trio is impeccable and interplay between voices is well-balanced and clear. In the soft passages the group lost some of the resonance it achieved in the forte sections, but overall the performance has great conviction and charm. Next up is the world premiere recording of Portraits of Langston. This innovative and refreshing work, by the award-winning African-American flutist and composer Valerie Coleman, is a six-movement suite interspersed with readings of poems of Langston Hughes by Mahershala Ali, the American actor revered for his roles in House of Cards and The Hunger Games. Like the writing of Hughes, this work is diverse and full of African folk culture influences. The trio delivers a well-balanced and clean performance, though at times, I found it difficult to connect the poetry to the music. Ali’s voice seemed acoustically drier and emotionally out-of-sync with the group. Coleman evokes a wonderful American sound that is present throughout much of this compact disc. She has skillfully and successfully encompassed many styles in her writing. I found the piece extremely interesting and moving, but wished for a few more memorable melodic statements. Valerie Coleman is clearly one of our great emerging American artists and composers. The highlight of the recording for me was the Connesson Techno – Parade. This high-energy work is played flamboyantly by the group and seemed a perfect fit. The virtuoso piano playing of McHale was impressive and the technical ensemble work of the McGills was tight and flawless. Rachmaninov’s famous Vocalise was the least satisfying work for me. Unlike the other works on this recording, McGill’s clarinet tone seemed airy and did not draw me in to the beauty of this piece. Though I must confess, I found myself whistling the tune all day after hearing it just once. The arrangement clearly showcases the greatness of Rachmaninov and his ability to write an incredible melody. Paul Schoenfield’s Sonatina captures three different dance feels in this recording: “Charleston,” “Hunter Rag” and a “Jig.” This release mislabels this as a world premiere recording, as recordings by the Scott/Garrison Duo and Webster Trio precede it. That said, the group is in strong form for this work and their playful style is evident throughout. The composition captures each dance with great ease and the virtuosity of the playing is again evident throughout the group. Schoenfield is able to create a good balance between old and new traditions by using the rhythmical influences of these traditional dance styles and blending them with his modern style of composition. two short works of Irish and Celtic heritage. They are both characteristically folk-like and contain a pensive and loving feeling. The Lark in the Clear Air could have been more convincing if the group had created a more semplice and sostenuto feel in the melodic lines, but still has a heartfelt quality. With this recording comes a booklet with well-written program notes by Elinor Olin from the Northern Illinois University School of Music. This is a fine recording with wonderful new additions for the chamber music trio repertoire. A lonesome traveler is wandering alongside a plowed field. Behind the distant hills the sun slowly begins to rise, coloring the cloudy grey sky in warm shades of pink and orange. This scenery depicted on the cover of the recording, a painting from 1830 by Caspar David Friedrich, perfectly captures the mood of the opening chords of the recording; bright and refreshing as the first rays of the morning sun, the music rises and unfolds itself in the most vibrant colors. Due to the historically informed rendering on period instruments, the music is presented as it might have been heard 200 years ago, opalescent yet translucent. Even 10-year-old Mikhail Glinka, who according to a letter witnessed a performance of one of the quartets, raved about the “unbelievable, novel impression” the music left on him. The author of this memorable music is no one less than the “chamber musician and clarinetist to the King of Sweden,” Bernhard Henrik Crusell. Crusell, who lived from 1775-1838, is mostly remembered today as a clarinet virtuoso who wrote three fabulous clarinet concerti and the variations on a Swedish theme. 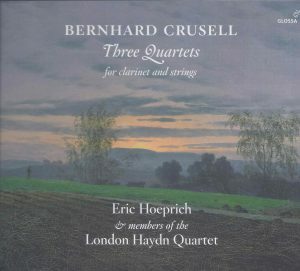 However, Crusell also composed three equally beautiful quartets for clarinet, violin, viola and violoncello. Since no autograph has been found, the recording is based on the first editions of the quartets, published in the years 1812, 1816 and 1823. They are presented in reverse chronological order on the disc, starting with Op. 7 in D major, then Op. 4 in C minor and ending with Op. 2 in E-flat major. As a common structure they each have four movements, and with the exception of the Quartet Op. 4 in C Minor, where the Menuetto precedes the slow movement, they roughly follow the compositional structure of their time. While the framing Allegro and Rondo movements are of a lively brilliant character and require great virtuosity of the instrumentalists, the menuetti are of a light-footed and elegant tone. Especially imaginative and appealing are Crusell’s slow movements, titled “Romance” or “Pastorale,” where lovely arioso themes are bestowed on the clarinet, expressing the sort of “northern melancholy” inherent to Crusell’s compositions. The rendering discussed here has been recorded in 2016 by clarinetist Eric Hoeprich and members of the London Haydn Quartet. Hoeprich, a well-known expert on original instruments, performs on a 10-keyed boxwood clarinet modeled after Crusell’s original instrument, which was made by Heinrich Grenser, Dresden and is in possession of the Musikmuseet Stockholm. The quartets Op. 2 and 4 are written for a clarinet in B-flat; Op. 7, however, requires a clarinet in A, which in the 19th century was obtained through a corps de rechange, a longer middle joint that could transform a clarinet pitched in B-flat into an A clarinet. Hoeprich’s playing displays great virtuosity, supple articulation and a singing tone quality, with a luminous and bright sound in the altissimo and a warm voice in the lower register. The string players also use period instruments with gut strings and lighter bows, giving the ensemble a homogenously brilliant yet warm sonority, complementing that of the clarinet. The ensemble’s rendering of the quartets is an expressive indulgence, the musicians breathe together and the music feels as if coming out of one heart and soul. Besides a few moments where the strings slightly overpower the clarinet in loud sections and a lack of edge in the clarinet’s articulation possibilities compared to the string section, there is really no desire left unfulfilled by this disc. Five golden reeds from my side! 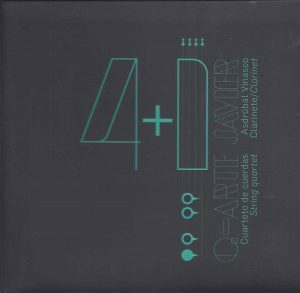 4+1 is a CD of modern works for clarinet and string quartet featuring music by Latin American composers. Clarinetist Javier Asdrúbal Vinasco performs with the Q-Arte String Quartet, and together they produced a virtuosic, engaging and well-engineered recording. Vinasco plays with a beautiful sound and great expression which is matched by the nuanced and compelling performances of the members of the Q-Arte Quartet. Each piece presents a diversity of content, colors, textures and technical demands that are performed at the highest level of artistry and refinement. Pacific Serenade, Op. 58, by the Uruguayan composer Miguel Del Águila is the first piece. Written in three movements, this work evokes moods and sonorities that reminds one of music one might hear “after hours” in a South American night club. Vinasco performs the simple song-like melodies with a smooth and sensuous tone and natural flowing phrases appropriate to the style. His melodic lines are supported by rich string textures and colors which function not only to accompany the melody, but to create atmosphere and establish style. The balance of instruments in the recording is perfect and spacious. This piece is ideal for the stage, but also to listen to on a stereo and relax at the end of a long day. The remaining four works are more modern, much more of what one might expect on a recording project of new music. Quinteto para cuerdas by Colombian composer Blas Emilio Aterhortúa and Amaru by the Peruvian composer Celso Garrido-Lecca are both engaging works that are based on recognizable melodic lines, but utilize a modern harmonic and rhythmic language. Although both works do sound different in their content, the challenging virtuosic demands and impressions of the recorded performances are more or less the same. Both pieces feature complex interactions between Vinasco and the individual members of the quartet. The ensemble is tight and impressive as the performers effortlessly shift between sustained florid musical lines and complex motivic gestures. The quality and beauty of Vinasco’s playing is remarkably consistent as he shifts from one texture to the next, and collectively the ensemble plays with the refinement and excitement of a truly great chamber ensemble. Helix by the Colombian composer Andrés Posada was commissioned specifically for this project. Unlike the previous works, this piece is more atmospheric and relies less on a rhythmic pulse to drive the music. Glissandi, microtones and complex textures establish the tonal environment for the piece. The clarinet part requires the use of multiphonics, microtones, timbre trills and harmonics, as well as frequent glissandi. Vinasco executes these extended techniques effectively and is able to blend them perfectly into the textures and string sounds that evolve around him. This performance is compelling and the writing is extraordinary. The final piece is Jardín do Otoño by Mexican composer Javier Álvarez. This is a large-scale work consisting of four movements. The first and third movements focus on long sustained pitches and shifting colors with an almost kaleidoscopic effect. Each player shows great skill in their control of sonority and creation of beautiful and expressive lines. The second and fourth movements are more driving and angular, with the performers developing and exchanging motivic gestures with great precision and energy. Throughout this recording, the ensemble does a truly outstanding job bringing this piece to life by delivering an engaged and dramatic performance. 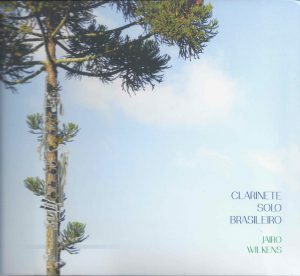 Brazilian clarinetist Jairo Wilkens’ first album, Clarinet Solo Brasileiro, showcases the solo clarinet writing of Brazilian composers between 1942 and 2016. There is a wealth of solo repertoire written by Brazilian composers, and it is interesting to hear the varied styles on this recording. Wilkens studied at the School of Music and Fine Arts of Paraná, as well as Indiana University and the University of Missouri–Columbia. He serves as clarinet professor at University of the State of Paraná School of Music and Fine Arts, performs with the Municipal Symphony Orchestra of Campinas, and regularly plays in the Duo Palheta ao Piano with pianist Clenice Ortigara. In addition, he was a featured guest artist at ClarinetFest® in 2008, 2010 and 2014. The album includes two pieces by the prolific Brazilian composer Claudio Santoro: Fantasia Sul América and Três Estudos. Santoro wrote South American fantasies for many orchestral instruments for the 1983 Young Interpreters of Brazilian Music Contest. The clarinet fantasy is vibrant and brimming with character. Santoro showcases the expansive range and expressive potential of the instrument. Wilkens expertly executes the varied articulations and technical demands and demonstrates incredible control in the upper register. Três Estudos is a good study for refining tonal consistency and smooth legato between wide intervals. The second is especially memorable with its dance-like rhythms and rapid technical patterns that recall bird songs. Santoro’s student, Guilherme Bauer, composed Três Peças beginning in 2008. According to the liner notes, the first movement references Caravaggio’s use of chiaroscuro in his paintings. Fortissimo interruptions abound in the lyrical second movement. The third movement opens with a distinctive oscillating ascending motive and includes playful passagework. I especially enjoy the dialogue Wilkens creates between the lines as well as the bubbly articulated gestures. IGUAÇU and Inquietações were written in 2016 and dedicated to Wilkens. Eduardo Frigatti’s IGUAÇU was named after a river and attempts to “find the ONE that exists in contrasting events.” It features varied techniques, including glissandi, multiphonics, flutter tonguing, pitch-bending, vibrato, tremolos and microtones. The rapid outbursts are memorable as are the upbeat melodic sections. Wilkens plays with a clear sense of direction and allows the disparate technical elements to flow seamlessly into one another. Alexandre Ficagna’s Inquietações also includes extended techniques, rapid outbursts and dramatic dynamic contrasts and was written in memory of the composer’s uncle. One of my favorites is Ronaldo Miranda’s lively Lúdica I. It is full of energy and character and was also composed for the same competition as the Fantasia Sul América. Wilkens plays with a beautiful and rich tone and skillfully navigates the technical challenges. Also written in 1983, Harry Crowl’s Introspecção features moments of unmeasured elements, including flutter tonguing, out of which virtuosic melodic figures rise. Extended techniques, including the use of microtones, add color to the texture. Wilkens gives a committed performance, although I found a few fortissimo sections to be slightly forced. Liduino Pitombeira wrote his Suite for Clarinet in three attractive movements. The playful first movement opens with a memorable major seventh motive and is based on the interval of a minor second. The second movement is a lullaby that recalls motives from the first, while the third is “a fast type of march danced frenetically at the carnival” with rhythmic energy and percussive gestures. Wilkens accentuates the strong rhythmic drive of the outer movements and plays with the requisite character. a beautiful and even tone across the registers and imparts great clarity to the articulated passages. Antonio Gilberto Machado de Carvalho’s Três Movimentos is rhythmic and exciting. I especially like the first movement’s driving accelerando and fast articulations as well as the bold opening of the third movement. perfect for an encore. Bravo to Wilkens, who brilliantly plays the continuous articulated runs at a lightning-fast tempo! This is an incredible performance, and I cannot think of a better way to complete this enjoyable journey through Brazilian solo clarinet literature. 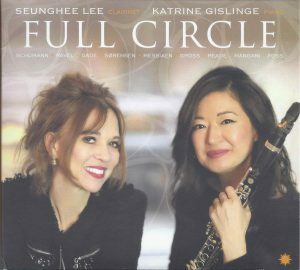 Full Circle by Seunghee Lee and Katrine Gislinge is a series of lyrical and expressive works for clarinet and piano. 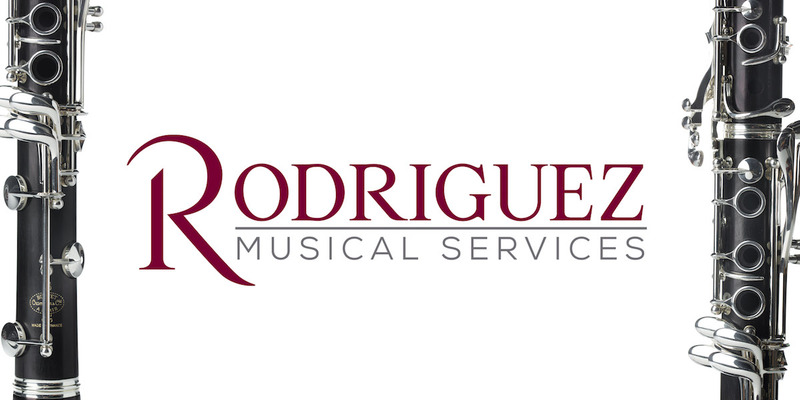 It contains some repertoire standards, some transcriptions, and some original works from the 20th and 21st centuries, all of which focus on melodic playing. The works are short or consist of short movements that are overwhelmingly pleasing and largely tonal. The recording of Paul Reade’s Suite from the Victorian Kitchen Garden is a highlight of this project. The sweet innocence of the work is matched by Lee’s light, shimmering sound. She perfectly encapsulates the breezy quality of the music and her interpretation should be emulated by any performer approaching this work. good works to perform on a concert if looking for a gentle foil to a larger, more aggressive work. The transcription of Messiaen’s Vocalise-Etude is another way for clarinetists to experience Messiaen in a chamber setting beyond his quartet. Though an early work, it has the color palette associated with Messiaen’s works which is brought to life by Lee’s interpretation. The Pièce en Forme de Habanera by Ravel also works well for clarinet, despite the fact that it was originally written for bass voice. The two standard 19th-century works, Fantasiestücke, Op. 73, by Robert Schumann and Fantasy Pieces, Op. 43, by Niels Gade, are well known to clarinetists. These works typically elicit thoughts of the dark richness of the Germanic clarinet sound and the plethora of colors a skilled performer can produce, demonstrating many moods and characters. In both recordings, the performer’s lighter and brighter sound is a departure from what is often expected. Lee does not adjust the quality of her sound for the works she is approaching, which is an interesting yet viable choice. It may or may not be pleasing to every listener, depending on his or her expectations. The level of contrast in the performances are more than appropriate and one feels the different moods the composers had in mind, yet the voice one hears is a departure from tradition. Three American Pieces by Lukas Foss was originally transcribed for clarinet and piano by Richard Stoltzman, but with the composer’s supervision, Lee edited the transcription to make it more idiomatic to the clarinet. The work is in three energetic movements, with a short songlike passage in the second movement. 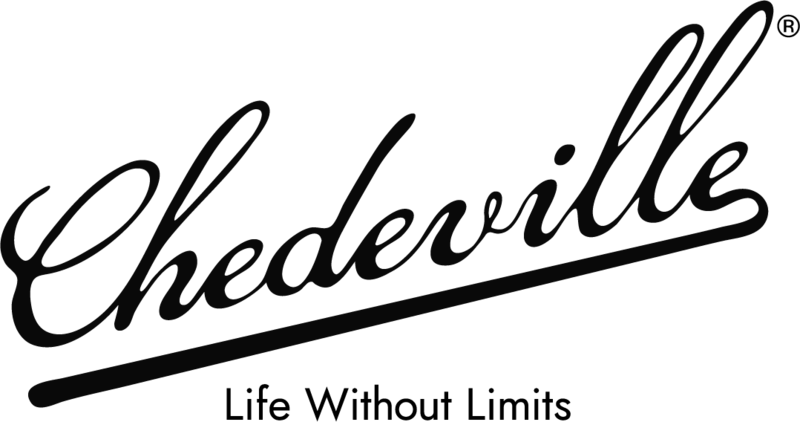 The double tonguing in the third movement sounded heavy and difficult at the tempo Lee was taking. I am not convinced that this movement works well for clarinet, though Lee makes a valiant effort. One could consider playing the movements on their own, as they could stand alone as independent works. This recording is a series of beautiful works in which the star recordings are not the standards of the repertoire, but the more modern original works that are sure to be a delight to clarinetists looking for something new to perform. Lee’s approach to the clarinet is unique and uncompromising, and her love of lyricism and romanticism is clear. 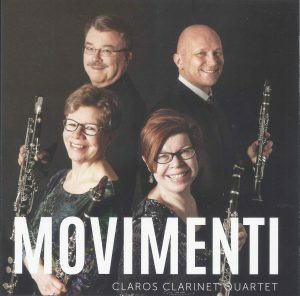 The Claros Clarinet Quartet was established in 1999 by four Finnish clarinetists and educators who have concertized in Finland, Hungary, Slovenia and Italy. In 2017 they recorded their compact disc Movimenti, with support from the Finnish Clarinet Society. The attractive booklet includes a photo gallery, group biography and liner notes about the composers in Finnish with English translations. Individual biographies would have enhanced it, especially for those unfamiliar with the group. The instrumentation varies for each piece as noted in this review. The blend of the group is nice, with occasional discrepancies in balance between inner parts and the E-flat clarinet, but the overall playing features lovely tone quality. The excellent repertoire on this recording includes works by Paul Harvey, Ferenc Farkas, Michael Henry and Jacques Bondon. My favorite work was the opener by Michael Henry, a Jamaican-born Londoner, called Birdwatching (A Fancier’s Handbook) for four B-flat clarinets in six movements. The work features fine playing by the quartet that depicts the whimsical, descriptive movements perfectly. “Swallows Fleeing,” “Sparrows Bickering,” “Vultures Looming,” “Capercailles Courting,” “Roadrunner Racing” and “Phoenix Rising” are all played with accuracy, energy, drive and tonal consistency. The legato connection and imitative passages handed off from instrument to instrument were smooth and silky, and I enjoyed the well-thought-out interpretations and execution. English clarinetist Paul Harvey, professor at The Royal Academy of Music, is well-known for his various articles and musical publications. His Quartetto di Quarantoli for three B-flat clarinets and bass clarinet is a work in four movements: “Rhapsody,” “Scherzo,” “Marcia Funebre” and “Galoppo.” Claros’s well-connected legato lines, sensitive blending and excellent soft dynamic balance and color variation are on display in this work. Their deft handling of the delightful and technical “Galoppo” is an especially fun listen. The last two works by Farkas and Bondon are scored for E-flat clarinet, two B-flat clarinets and bass clarinet, which results in a less homogeneous and more versatile color spectrum and sound. Ferenc Farkas’s Scenes from Hungary is technically easier than the other three works, but isn’t played quite as well. Group attacks are somewhat flawed and there are minor tuning issues throughout. The E-flat clarinet tends to overpower the texture and balance at times in “Play,” “Shepherd” and “Round.” While some nice musical lines are executed, the group sounds brighter and thinner than the other works. Jacques Bondon’s Movimenti is a substantial 15-minute work and the first movement is a knockout. In this well-written movement the playing is controlled with impressively executed technique and excellent blend. The second movement is slow and somewhat repetitive, making it difficult to sustain musical creativity. The last movement, “Allegro deciso,” has some unevenness between the imitative lines, overdone articulations, and attacks that are not in sync. In addition, I felt this movement could have used better musical shape. However, the work did have more reverberation in the recorded quality which added warmth to the group’s tone color. While this recording has some slight flaws, the selection of compositions could not be better. All the quartets could serve as fine recital selections for good amateur and professional players and be fun and challenging to work up and perform. The variety of style of the works was well-served by the Claros Clarinet Quartet and their recording is an excellent representation of the music. This recording by Trio 402 is an offering of lesser-known or more recently available works by William Hurlstone and Bill Douglas for clarinet, bassoon and piano. Clarinetist Diane Barger is currently professor of clarinet at University of Nebraska–Lincoln, is principal clarinet of Lincoln’s Symphony Orchestra and actively serves in the International Clarinet Association. Barger recently recorded Bling Bling, her solo album of music by Scott McAllister and others on the Potenza Music label. Her primary teachers were Frank Kowalsky and Robert Marcellus. The other artists in Trio 402 are Barger’s colleagues at the University of Nebraska–Lincoln. Jeffrey McCray is professor of bassoon, principal bassoon of Lincoln’s Symphony Orchestra, and a member of the Colorado Springs Philharmonic. Mark Clinton is professor of piano, head of the keyboard area and a Steinway Artist. British composer William Yeates Hurlstone (1876-1906) devoted much of his short life of 30 years to composing chamber music, some thankfully including clarinet. One can’t help but wonder “what might have been” – as McCray writes in the liner notes – for this talented composer who studied with Sir Charles Stanford at the Royal College of Music. His Variations, the opening of this recording, precedes Hurlstone’s formal training, completed at age 17. Hurlstone’s experimentation in his use of the three timbres throughout the variations and counterpoint is mature for his age. His variation in 5/8 is particularly remarkable. The trio’s youthful approach is spirited and assured. Barger’s tone is cored and crystal clear. Balance is fine throughout, note lengths are well-matched and precision is with synchronicity. Hurlstone’s Trio in G minor was completed only two years later and reflects his formal training. It is a full-length, substantial 25-minute work in four-movement symphonic structure, with first and last movements in sonata form. Based upon research of Richard Moore, early editions of this work are seriously flawed. He found, when examining the autograph, that the third movement, Scherzo, had been omitted, the first and last movements were interchanged and many other alterations made. Moore’s fascinating research can be found online at MusicWeb International. An updated edition in 2006 includes the Scherzo and correct movement order. Trio 402 is up to the emotive, dramatic, and substantive qualities of this music. Here, very expressive playing is noted from all three. Blend is admirable, and balance, particularly at points of dynamic alteration, is effectively achieved. Composer, pianist and bassoonist Bill Douglas performed for decades with clarinetist Richard Stoltzman. His Trio No. 2 was a result of a commission by a consortium of 123 clarinetists and bassoonists in 2010. Douglas’ distinct jazz-influenced style and harmonies are present here. 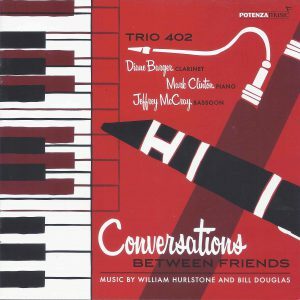 The trio achieves great dialogue, or “conversation” as in the album title. Their approach to the work really shines in the third movement, “Rondo Antico,” which has a nifty lilt and a charming, more intimate and laid-back feel. The recording features touching, heartfelt liner notes authored by bassoonist Jeffrey McCray. Informative, yes, but McCray also offers a personalized commentary about friendship, as the album title touts. Collaboration of collegiality and companionship for more than ten years by Trio 402 is evident through their performance of these works. This is an excellent recording that provides exposure to these works through great chamber music playing captured by a well-done production. Single Reed Expressions (8 volumes). 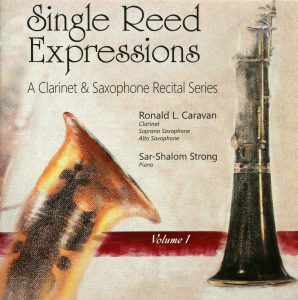 Ronald L. Caravan, clarinet, soprano and alto saxophones; Sar-Shalom Strong, piano. C.M. von Weber: Grand Duo Concertante; W. Hartley: Sonatina Romantica, Metamorphoses, Diversions, Duo, Sonorities IX and Petite Suite; R. Caravan: Excursions, Quiet Time, Sketch, Sonata, Recitation, Fantasy Piece, Monologue, Improvisation (Romani), Soliloquy & Celebration “A tribute to the classic jazz saxophonist Paul Desmond” and Echoes of a Crimson Twilight; F. Tull: Sarabande & Gigue; J.D. Lamb: Three Antique Dances; K. Husa: Postcard from Home and Elegie & Rondeau; J. Demersseman: Fantaisie-Pastorale; L. Lunde: Sonata “The Alpine”; R. Schumann: Fantasy Pieces, Op. 73; W. Osborne: Rhapsody; S. Rachmaninoff: Vocalise, Op. 34; W. Benson, Aeolian Song; P. Creston: Sonata; J. Brahms: Sonatas in F Minor and E-flat Major, Op. 120, Nos. 1 & 2; C. Debussy: Première Rhapsodie; E. Dressel: Partita; J. Corigliano: Clarinet Caprice and Serenade & Rondo; J. Massenet: “Meditation” from Thais; O. Mácha: Pláč Saxofonu; E. von Koch: Sonata, Monolog No. 3 & 4, Dance No. 2; F. Poulenc: Sonata; I. Stravinsky: Three Pieces; R. Muczynski: Time Pieces and Sonata; J. Rueff: Chanson et Passepied: P. Maurice: Tableaux de Provence; D. Bédard: Fantaisie; P. Hindemith: Sonata; B. Martinů: Sonatina; E. Krenek: Suite, Op. 48; K. Reiner: Dvě Skladby; B. Heiden: Solo, Sonata and Sonatina; E. Gates: Incantation & Ritual; L. Bernstein: Sonata; S. Adler: Canto XIV, A Klezmer Fantasy and Canto IV; R. Starer: Dialogues; J. Worley: Sonata; E. Siegmeister: Around New York; E. de Coriolis: Tarentelle; R.R. Bennett: Sonatina; A. Berg: Vier Stücke; R. Sierra: Cinco Bocetos; K. Penderecki: Three Miniatures; O. Bull: Saeterjentens Søndag; L. van Delden: Sonatina; E. Bozza: Aria. Mark Records 51601-51608 MCD. Total time 05:29:00. Amazon.com and iTunes. American single reed virtuoso Ronald L. Caravan presents meticulously crafted interpretations of quality repertoire for solo single reeds in the eight-volume set Single Reed Expressions. This set represents the culmination of Caravan’s 40-plus year career as a performer, teacher, composer, arranger, author and mouthpiece designer. Most notably, Caravan served on the faculty of Syracuse University from 1980 to 2015, teaching applied clarinet and saxophone and directing the Syracuse University Saxophone Ensemble. During this time, he performed an annual faculty recital which placed equal emphasis on showcasing works for clarinet and saxophone. His recital programming ranged from established classics to progressive new works, including his own compositions. This set follows Caravan’s recital model, with an equal division of works for clarinet and saxophone. In addition to the conventional repertoire, each disc includes one of Caravan’s compositions and one piece for the soprano saxophone. Furthermore, at least one composition on each disc utilizes unconventional sound techniques such as quarter-tone intervals, timbre variation, multiphonics, uncommon tremolos and trills. The sheer variety of compositions is staggering, and the set presents ample opportunities for performers and aficionados to relish hearing familiar repertoire while engaging with new and interesting compositions. note to the entire work. Meticulous attention is paid to executing every gesture with grace, finding ease even when performing extreme registers and difficult extended techniques. Perhaps most striking, however, is Caravan’s ability to record this sheer volume of repertoire at this high level of performance for not just one, but three instruments (clarinet, soprano and alto saxophones). Each composition is presented convincingly, and without bias to genre or the performance medium. Caravan is unequivocally convincing as a master performer of both the clarinet and saxophone, leaving the listener with no hint of which instrument he would consider as “primary.” Furthermore, the ordering of pieces illuminates substantive programming opportunities for a solo recital that includes both the clarinet and saxophone, a testament to Caravan’s many years as a practitioner and pedagogue of a substantive single reed studio at a quality university music program. These masterful recordings showcase the immense variety of recital repertoire available to advanced performers of the clarinet or saxophone. Overall, it provides an abundance of opportunities for the university pedagogue to engage students with standard and contemporary repertoire, while also serving as a solid base for teachers of a single reed studio to enhance their own knowledge base. This eight-volume set is an invaluable addition to any university library or single reed studio resource collection.